Dimbanyika is regarded as the founder of a united Vhavenda nation since he is the one who subjugated Vhangona clans and other clans such as Vhalembethu of Ha-Mutele and Thulamela, and Vhatavhatsindi of Fundudzi to establish a nation known as Vhavenda. Dimbanyika ruled from 1688 until he died on Mount Lwandali in 1722. Dimbanyika was succeeded by his son, Vele-la-Mbeu. The Ramabulana royal house’s version of history is that Vele-la-Mbeu fathered Tshavhungwa, a girl, from the first house, Thohoyandou from the second house, Tshisevhe, from the third house and Tshivhase (Raluswielo) from the fourth house. But the Ravhura royal house’s version disputes that of Ramabulana. The Ravhura house argues that Thohoyandou was not Vele-la-Mbeu’s son. They argue that Thohoyandou was Dimbanyika’s son and therefore Vele-la-Mbeu’s brother. Both the Ramabulana and Ravhura houses agree on the fact that Vele-la-Mbeu’s eldest child was a girl named Tshavhungwa. They both agree that Tshavhungwa could not take over because of her gender. But they differ on who was supposed to take over the kingship. The Ravhura house argues that Tshisevhe, as Vele-la-Mbeu’s first born son, was supposed to have taken over after Vele-la-Mbeu’s death. They state that Tshisevhe was still young when Vele-la-Mbeu died, and that Thohoyandou was appointed as a regent. It is, however, unclear why a regent would rule for 48 years (Thohoyandou ruled from 1722 until his disappearance in 1770). What is clear though is the fact that a war of succession ensued between Munzhedzi (Thohoyandou’s son), Tshisevhe, and Raluswielo after Thohoyandou’s disappearance. Tshisevhe was assassinated by Munzhedzi Mpofu in the war of succession. Tshisevhe’s son, Ravhura, fled to Makonde after his father’s assassination. Ravhura is said to have disappeared without trace. He was succeeded by his younger brother Malise. Malise was succeeded by Jim Masindi Badaga who ruled from 1911 to 1955. Masindi was succeeded by Solomon Mavhungu. Mavhungu was succeeded by Azwianewi Mutshinyalo. Azwianewi Mutshinyalo committed suicide in September 2012. He was succeeded by his son, Tshinetise, who ascended the throne in October 2014 at the age of 12. But since he is too young, a regent has been appointed to run the affairs of Makonde until Tshinetise, whose title is Tshedza, is old enough to take over. 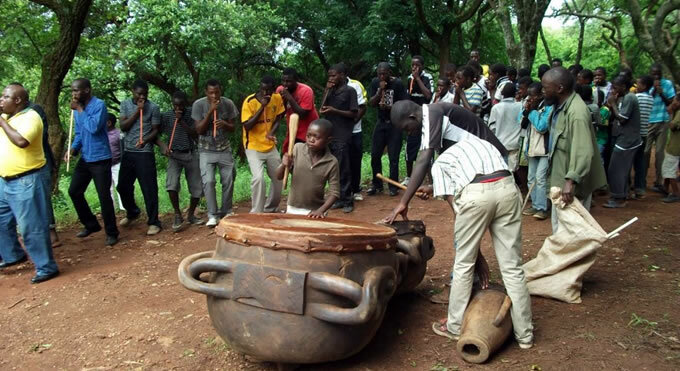 Makonde is well known as the place visited periodically by Mwali/Nwali, the supreme God of Vhavenda. Oral history has it that the Makonde shrine was established by the Vhambedzi. Vhambedzi, together with Vhangona, are regarded as the original Vhavenda. The Vhambedzi kingdom stretched from Masvingo, Zimbabwe to Vhumbedzi, North-Eastern Venda. The Vhembe River (Limpopo River) was never a barrier between the people living on either side of the river. The Vhambedzi royal kraal was in Malungudzi (Marungudzi in Karanga) in Masvingo. The Vhambedzi were renowned rainmakers. The first Vhambedzi group to settle in North-Eastern Venda settled at Zwaluvhimbi, Ha-Makuya. From there the group settled at Ha-Luvhimbi. Makonde under Ha-Luvhimbi. Later the group split into two: Tshisinavhute and Luvhimbi. The Tshisinavhute group moved to Mianzwi, while the Luvhimbi group remained at Ha-Luvhimbi. It is believed that the two groups split due to the fact that Tshisinavhute, wanted to be chief but Luvhimbi would not allow her to be one. The two Vhambedzi groups paid tribute to the King in Malungudzi. But later on great distances and the disintegration of Vhambedzi settlements led to the establishment of small autonomous groups at Ha-Luvhimbi and Mianzwi, and other lesser-known units at Ha-Mukununde, Tshikweta, and Masetoni. But whenever the South African Vhambedzi failed to cause rain to fall, they would send their messengers to Malungudzi where the Malungudzi Mbedzi would contact Nwali (Great God) on behalf of Vhambedzi south of Vhembe. When Ravhura fled from Dzata after Tshisevhe’s assassination, he conquered Makonde which was under Khosi Muthivhi. Ravhura became the new Khosi of Makonde. The Nwali shrine had already been established when Ravhura settled at Makonde. Nwali continued to visit Makonde and to communicate with Vhavenda from Mount Makonde even after Makonde was conquered by Ravhura. The other shrine which was visited by Nwali was Ha-Tshivhula, west of the Soutpansberg mountain range (where the Soutpansberg range starts). The area was under Khosi Tshivhula whose jurisdiction included present day Vivo, Waterpoort, Mapungubwe, Alldays, and Musina. The Tshivhula community (Tshivhula/Sebola, Lishivha, Mulambwane and Machete) was forcibly removed from their land by successive Boer and apartheid governments. Some settled at Mufongodi (Straightheart) in Nzhelele, while some settled at present day Marobyane and Ga-Kibi. The other Nwali shrine was at Donwa at Ha-Matsa, Nzhelele. There was another shrine at Tshitangani, next to Lake Fundudzi, known as Madindini a Nwali. But the Makonde shrine was regarded as the most important one. The other shrines, from Tshivhula to Donwa to Madindini a Nwali, were regarded as stations for Nwali on His way to Makonde. The occurrence of a solar eclipse (Mutshakavhili) in Venda is regarded as a visit by Nwali. People were not allowed to watch the event since it was believed that Nwali would be passing all over Venda on His way to His shrine in Makonde. It was believed that Mutshakavhili happened when Nwali was angry and that He had visited Venda to tell His people what He was not happy about. After the solar eclipse had passed Vhotshifhe (chief priests) would go to the cave on Mount Makonde to find out why Nwali was angry and what needed to be done to rectify the mistake and to pacify Nwali. After a meeting with Nwali, Vhotshifhe would deliver Nwali’s message to Khosi of Makonde village. The Khosi of Makonde would then have the responsibility of passing on the message to the king and other Mahosi in Venda. The king and his Mahosi would then call people in different areas to attend special gatherings and explain to them why Nwali was angry and what needed to be done to pacify Him. People in different areas would then set dates for religious ceremonies (thevhula). Mpambo (beer brewed for religious ceremonies) would be brewed for the ceremonies. Bulls would be sacrificed on the day(s) of the ceremony and religious rituals would be performed to ask for forgiveness. Vhotshifhe would then deliver Mpambo, food, and anything that Nwali requested to the different shrines in Venda. All the offerings had to be placed at the entrances to the shrines. They would then wait to see if Nwali had accepted their apology. Fires would then spring from the shrines and consume all the offerings. Vhotshifhe would then go back to the villages to deliver good news. Thereafter people would feast and tshikona would be performed. Nwali would then leave Mount Makonde and visit the other shrines on His way back to Malungudzi. He would consume Mpambo and food placed in all the other shrines.